The contest has ended! THANK YOU all for participating!! It was a great turnout and we hope you all had fun playing! Congrats to our 3 winners!! You will be receiving your copy of Disgaea Infinite very soon! 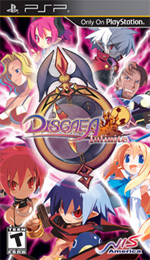 For the rest of you, we are excited to say Disgaea Infinite has been released today, June 8th! Yay!! It is available both on UMD and on PSN! Here is the link! Thank you all again! And hope you guys will have fun in our the next contest! ©2009-2010 NIPPON ICHI SOFTWARE, INC. All rights reserved. Licensed to and Published by NIS America, Inc. "PlayStation", "PS" Family logo and "PSP" are registered trademarks of Sony Computer Entertainment Inc. The rating icon is a trademark of the Entertainment Software Association.